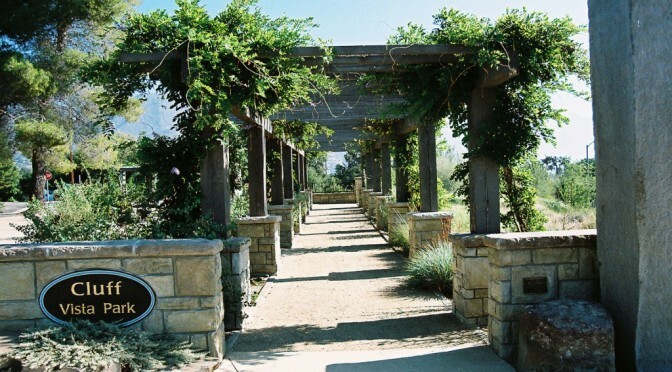 Cluff Vista Park occupies a triangle of land in the midst of Ojai. Once the site of a gas station, then an abandoned lot for many years, Ojai’s citizens were delighted when the property was purchased by the Cluff family. The Ojai Valley Land Conservancy raised funds to landscape the park, which won an award for Tom Bostrom & Associates Landscaping in 2005. 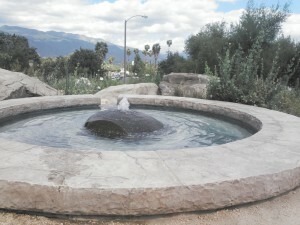 Some features are a huge stone monolith, fountain, a lovely pergola and native landscaping . If you’ve only driven by, you are missing a treat; stop by and view the park from its interior and you will be enchanted!